On the eve before the Great Depression, what the NEA called “America’s great crisis”, Chicago’s teachers found themselves in a contradictory and uncomfortable position. Although their pay and working conditions were better than the blue collar workers in the city, their work in the classroom was becoming increasingly difficult. There had been a dramatic increase in Chicago public school students all through the 1920s which left the schools scrambling for funding. The schools were largely financed through property taxes, and powerful corporations, along with real estate interests, had been dodging taxes for decades. The system was plagued with corruption and mismanagement and by the late 1920s was bogged down in lawsuits, court actions and a business-led tax strike. To make matters worse, the appointed school board had become a cesspool of financial corruption, especially under the gangster-tainted reign of Mayor William Thompson, an ally of Al Capone. By 1929, the year of the Wall Street stock market crash, Chicago was essentially broke. The schools in the immigrant inner city neighborhoods often lacked libraries, playgrounds or even adequate toilet facilities. The children, many of whom had only an uncertain grasp of English, were herded into overcrowded grim looking classrooms that one educational analyst described as resembling “enlarged prison cells”. Schools in Chicago’s growing African American neighborhoods were plagued by overcrowding and poor facilities. African American teachers faced relentless racial discrimination. School administrators took over textbook choices and piled on more clerical work. They introduced a blizzard of standardized tests which one critic said reduced teachers to “automatons” and students to “mechanized memory machines.” The superintendent abolished the Teachers Councils, which had given teachers a voice in educational policy. This idea of a “noble profession” was supposed to make teachers to feel haughtily superior to their blue collar neighbors, even though their working conditions and pay lagged behind other professions such as medicine, law and business. The professionalism that was pushed on teachers had little to do with their skills and dedication to education, but everything to do with an ugly class snobbery. Teachers increasingly came to view this pseudo-professionalism with cynicism and suspicion. Then came the Wall Street Crash of 1929. In the wake of the disaster, teachers eventually organized militant street demonstrations which became the impetus for the founding of the Chicago Teachers Union (AFT Local 1). However teacher militancy did not begin right away. The shock of the Great Depression was too terrible. By 1932, half of the Chicago labor force was out of work and those who did have jobs found their wages cut. Teachers were paid their monthly salaries only three times between January 1931 and May 1933. They did not receive regular paychecks, but were paid in “scrip” which had to be redeemed by businesses and banks who did not honor their full value. Paul Schneider, who had taught manual arts at Washburne High School, shot himself to death in despair before his wife and children. Later it was discovered that his life insurance had lapsed. In the face of the social catastrophe, Chicago teachers stayed on the job despite the payless paydays, determined as one Chicago teacher put it “…not to desert the Chicago schools.” Teachers raised $112,000 to buy clothes and provide breakfasts for needy children and despaired that they could not raise more. Teachers also came to understand the importance of organizing resistance to the corrupt oligarchy who had made Chicago’s school funding crisis the worst in the nation. That was not easy. Only 10% of the teachers belonged to the four competing teachers’ unions, all of whom opposed any militant action, preferring petitions and lobbying. The first sign of militancy came at the end of 1931 when 26,000 people organized by the teachers’ unions and community groups held a mass meeting that helped prevent the actual closure of the Chicago schools. Teachers began to believe that public education itself was under attack along with the democratic values that it represented. They saw education as a way to empower Chicago’s largely working class student population and provide a path of social mobility. 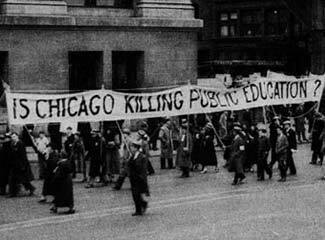 Harry Tate of the Chicago Teacher Voter Association addressed a 1932 teachers’ mass meeting by calling schools “the last bulwark protecting American democracy.” In a nation where many believed the entire economic system was on the point of a violent collapse, this was not idle hyperbole. Totalitarian movements were on the march and working class resistance was critical to preventing their spread. It takes a spark to set off a militant mass movement in the streets and that spark came on March 17, 1933 when teachers discovered that school janitors, many of whom were patronage employees protected by Chicago’s political machine, had received a secret raise when teacher’s pay was cut in January. Frustrated by the lack of results from cautious union leaders, hundreds of teachers marched to the mayor’s office on March 21 and assured him that they would return every Tuesday until teachers were paid. Teachers also organized a boycott of businesses that were still evading taxes. Elementary school teachers staged a one day sick-out in early April. That was followed later that month by a high school teachers’ sick-out with thousands students joining them in a sympathy strike. At an April Board of Education meeting the president of First National Bank was loudly booed by teachers who had packed the meeting after 3000 of them had protested in the Loop. On April 15, teachers received a partial payment of back wages, but that did not stop 8000 teachers who marched to visit Charles Dawes, former US vice-president and head of City National Bank and Trust Co. The teachers wanted to know why the bank had just been bailed out to the tune of $90 million by the new Reconstruction Finance Corporation, but could not help the teachers get paid. All hell broke loose on April 24 when 5000 teachers converged on five of Chicago’s largest banks who had refused to buy the tax warrants that were needed to pay the teachers. Once inside teachers confronted the bankers with chants of “Pay us! Pay us”, as they trashed the offices by turning over desks, smashing windows and throwing ink on the walls. A week later there was a similar demonstration at the Chicago Title and Trust Company that involved a pitched battle with mounted Chicago police. The violence got the attention of Chicago Mayor Ed Kelly and representatives of the major banks who hastily promised relief. The VEC announced that the teachers would receive 4 months of the nine months owed to them at a huge rally in Grant Park on May 13 . Then on June 9, the last day of school, there was another confrontation with police as 5000 people protested in the Loop against the banks. Most of the marches were organized by a new group called the Volunteer Emergency Committee(VEC). The VEC was led by a charismatic PE teacher named John Fewkes who belonged to the Men’s Teachers Union(MTU), one of the four Chicago teachers’ unions of the time. Even Margaret Haley of the Chicago Teachers Federation(CTF), who was very sparing in her praise of rival teacher union leaders, called him,”…a fine specimen of physical manhood, well built, and he had a demeanor that was impressive.” Fewkes made it clear that the VEC was a one issue group focused solely on teachers’ pay. Chicago’s business community had also been organizing, with the Citizens Committee on Public Expenditures (CCPE) as the result. With the support of the CCPE, the banks had consistently refused to lend any more money to the hard pressed Chicago schools. It was essentially a banker’s coup with even the CCPE admitting they had “taken charge”. But even after their downtown offices were wrecked, the banks continued to arrogantly set school policy. On July 12, 1933, the Chicago Board of Education approved a budget that stunned the packed meeting room with cuts so drastic that School Superintendent William Bogan, who had not been consulted, was seen holding his head in his hands in shocked silence. Helen Hefferan, a Board member whom the others suspected would oppose the cuts, was not even invited to the meeting. After the fateful July 12 meeting, the Board steadfastly refused all requests for an audit, presumably to protect financial irregularities and the many political patronage employees. The US Commissioner on Education called the cuts “a return to the dark ages”. That evening the VEC joined the new Citizens Schools Committee(CSC) made up initially of teachers, the PTA and the city’s leading women’s organizations. The following week the CSC held a rally at the Chicago Stadium that drew more than 30,000 followed by renewed lobbying efforts. The first day of school in September was chaos as a result of the financial carnage, so the Board, on the defensive, effectively rescinded the worst of the cuts by October. Then in 1934, with federal money, the teachers finally got all their back pay. John Fewkes, whom Time Magazine called the “John L. Lewis of the teaching profession”, was, like the legendary Lewis, a militant, not a radical. Fewkes was anti-communist at a time when communists played an important and generally positive role in the labor rebellions of the Depression Era. Fewkes would use militant tactics, but only for limited objectives. He went on to become a founder of Chicago Teachers Union in 1937 and served as its president for many years. After the days of ’33 and the founding of the CTU in 1937, Chicago teachers generally rejected any Oliver Twist meekness before an ofttimes illegitimate authority. But teachers had difficult decisions to make– what exactly should their new union do? Should the union take a broadly social activist role, allying with other organizations for progressive change? Should the union confine itself to bread and butter economics? Should it take a stand on issues of curriculum and testing? How should it confront Chicago’s school segregation and the barriers faced by teachers of color? What was the union’s relationship to Chicago’s corrupt political machine? What was the role of radicals, socialists and communists within the union? Teachers would grapple with all of these questions in the decades to come. Today, the Chicago Teachers Union, under new progressive leadership, is facing many of the same problems that teachers did back in the first half of the 20th century, plus new ones, such as the drive for privatization of the schools. Today the very existence of public education faces a greater threat than in the worst days of the Great Depression, but Chicago’s teachers are showing no signs of complacency. My special thanks to John Lyons and the late Mary Herrick whose excellent primary research made this posting possible. ORIGINALLY POSTED TO BOBBOSPHERE ON THU AUG 02, 2012 AT 09:06 AM PDT. ALSO REPUBLISHED BY IN SUPPORT OF LABOR AND UNIONS, HISTORY FOR KOSSACKS, ANTI-CAPITALIST CHAT, READERS AND BOOK LOVERS, PROGRESSIVE FRIENDS OF THE LIBRARY NEWSLETTER, AND COMMUNITY SPOTLIGHT.